At Grossmont Dermatology Medical Clinic and Skin Cancer Treatment Center, patients in the San Diego area can enjoy quality care for a variety of skin and body concerns. Skin cancer is a serious diagnosis that should not be taken lightly. When patients hear the words “skin cancer,” they often have many questions for their physician. Skin cancer diagnosis and treatment is easier than any other type of cancer. With early detection and appropriate treatment, patients can recover from skin cancer and continue to live a high quality of life. Skin cancer is an abnormality of skin cells. 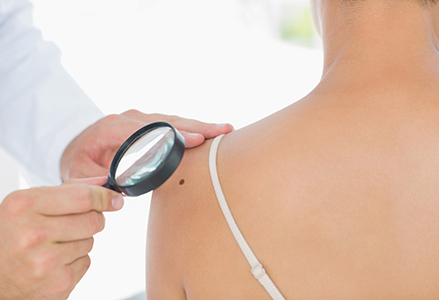 Skin cancer is often detected during skin cancer screenings or when patients come into the practice with an unusual or changing mole or skin tag. Skin cancer may appear as a non-healing sore. Biopsies are taken and sent to a laboratory to determine if skin cancer cells are present to provide an accurate diagnosis. What treatment is available for skin cancer? There are several types of treatment for skin cancer, but our team recommends Mohs micrographic surgery. Patients located in the of San Diego area or La Mesa, California are encouraged to take the time to learn about skin cancer diagnosis and treatment right here at Grossmont Dermatology Medical Clinic and Skin Cancer Treatment Center. Our practice is conveniently located at 8860 Center Drive, Suite 300 in La Mesa and we can be reached at (855) 977-4949. Whether you have already received a diagnosis and are interested in Mohs micrographic surgery, or if you are seeking education or a skin cancer screening appointment, we can help. Visit our professionals today, including Drs. Paul Dean, Robert Bushman, Maki Goskowicz, Christopher Crosby, and Shinko Lin.